, a learned archbishop of Dublin, was descended of an ancient family, and born at Antrim, in Ireland, May the 1st, 1650. At twelve years of age, he was sent to the grammar-school at Dungannon, in thu county of Tyrone; and at seventeen, to Trinity-college, near Dublin, where he took the degrees in arts, when he became of proper standing. In 1674 he was admitted into priest’s orders by abp. 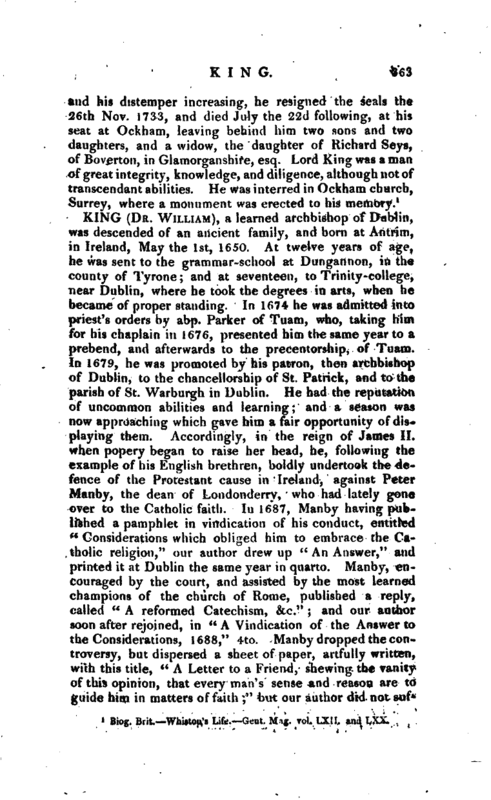 Parker of Tuam, who, taking him for his chaplain in 1676, presented him the same year to a prebend, and afterwards to the precentorship, of Tuam. In 1679, he was promoted by his patron, then archbishop of Dublin, to the chancellorship of St. Patrick, and to the parish of St. Warburgh in Dublin. He had the reputation of uncommon abilities and learning; and a season was now approaching which gave him a fair opportunity of displaying them. Accordingly, in the reign of James II. when popery began to raise her head, he, following the example of his English brethren, boldly undertook the defence of the Protestant cause in Ireland, against Peter Manby, the dean of Londonderry, who had lately gone over to the Catholic faith. In 1687, Manby having pub* lished a pamphlet in vindication of his conduct, entitled “Considerations which obliged him to embrace the Catholic religion,” our author drew up “An Answer,” and printed it at Dublin the same year in quarto. Manby, encouraged by the court, and assisted by the most learned champions of the church of Rome, published a reply, called “A reformed Catechism, &c.” and our author soon after rejoined, in “A Vindication of the Answer to the Considerations, 1688,” 4to. Manby dropped the controversy, but dispersed a sheet of paper, artfully written, with this title, “A Letter to a Friend, shewing the vanity of this opinion, that every man’s sense and reason are to guide him in matters of faith;” but our author did not | suffer this to pass without confuting it, in “A Vindication of the Christian Religion and Reformation, against the attempts of a late letter, &c. 1681,” 4to. The deanery of St. Patrick’s becoming vacant at this time, Dr. King was elected to it; and appeared so active in supporting the Revolution, which had now taken place, that, after the landing of king James in Ireland in 1689, he was twice confined in Dublin-castle. He was attacked, not long after, in a weekly “paper called” The Abhorrence,“with an intent to render him more obnoxious; and was also assaulted in the street, where a musket with a lighted match was levelled at him. He was likewise disturbed in the performance of divine service at his church several times, particularly on Candlemas-day; when seven officers who were there swore aloud that they would cut his throat. All this did not discourage him; but he still persisted, and took his doctor’s degree this same year, 1689. Upon king James’s retreat to France, after the battle of the Boyne in 1690, he preached a thanksgiving-sermon on that occasion in November; and, January following, was promoted to the bishopric of Derry. 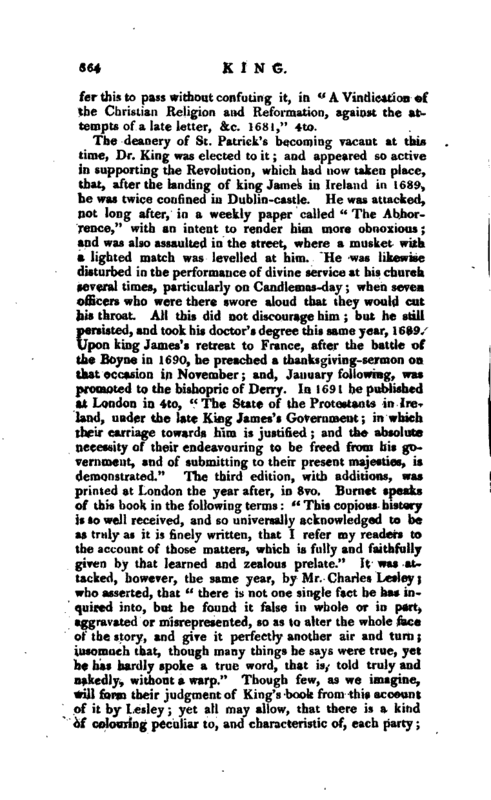 In 169 1 he published at London in 4to,” The State of the Protestants in Ireland, under the late King James’s Government; in which their carriage towards him is justified; and the absolute necessity of their endeavouring to be freed from his government, and of submitting to their present majesties, is demonstrated.“The third edition, with additions, was printed at London the year after, in 8vo. Burnet speaks of this book in the following terms:” This copious history is so well received, and so universally acknowledged to be as truly as it is finely written, that I refer my readers to the account of those matters, which is fully and faithfully given by that learned and zealous prelate.“It was attacked, however, the same year, by Mr. Charles Lesley; who asserted, that” there is not one single fact he has inquired into, but he found it false in whole or in part, aggravated or misrepresented, so as to alter the whole face of the story, and give it perfectly another air and turn; insomuch that, though many things he says were true, yet he has hardly spoke a true word, that is, told truly and nakedly, without a warp." Though few 7 as we imagine, will form their judgment of King’s book from this account of it by Lesley yet all may allow, that there is a kind of colouring peculiar to, and characteristic of, each party | and that the very same facts, when related by an historian of different political principles, shall have a very different appearance, and also make a very different impression upon a reader. The public tranquillity being now perfectly restored, the bishop applied himself more particularly to the duties of his pastoral care; and, reviewing the state of his diocese, pre*­sently discovered, that, by the great number of colonies lately transported from Scotland, many of his people were dissenters from the established church, which they opposed with as much zeal as the Papists. As he had therefore employed his pen against the Papists when danger was apprehended from them, so now he took it up against the Presbyterians, whom he endeavoured to persuade to conformity, in a piece entitled “A Discourse concerning the Inventions of Men in the Worship of God,” Dublin, 1694, 4to. 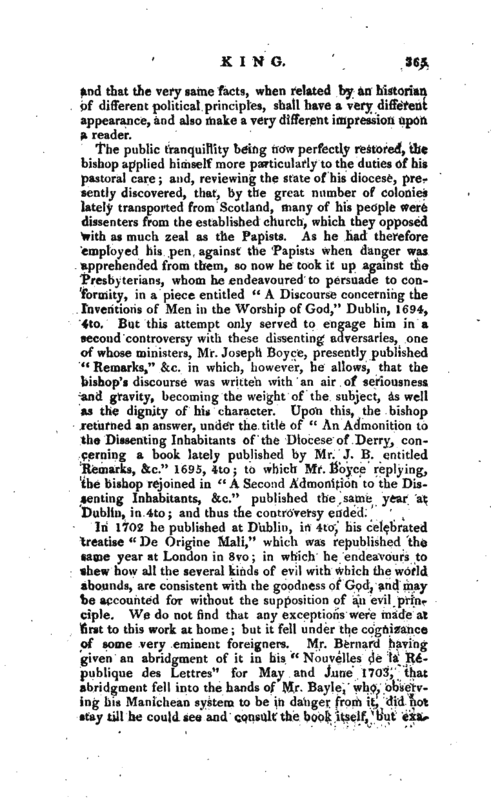 But this attempt only served to engage him in a second controversy with these dissenting adversaries, one of whose ministers, Mr. Joseph Boyce, presently published “Remarks,” &c. in which, however, he allows, that the bishop’s discourse was written with an air of seriousness and gravity, becoming the weight of the subject, as well as the dignity of his character. Upon this, the bishop returned an answer, under the title of “An Admonition to the Dissenting Inhabitants of the Diocese of Derry, concerning a book lately published by Mr. J. B. entitled Remarks, &c.” 1695, 4to to which Mr. Boyce replying, the bishop rejoined in “A Second Admonition to the Dissenting Inhabitants, &c.” published the same year at Dublin, in 4to; and thus the controversy ended. In 1702 he published at Dublin, in 4to, his celebrated treatise “De Origine Mali,” which was republishecl the same year at London in 8vo; in which he endeavours to shew how all the several kinds of evil with which the world abounds, are consistent with the goodness of God, and may be accounted for without the supposition of an evil principle. We do not find that any exceptions were made at first to this work at home; but it fell under the cognizance of some very eminent foreigners. Mr. Bernard having given an abridgment of it in his “Nouvelles de la Republique des Lettres” for May and June 1703, that abridgment fell into the hands of Mr. Bayle, who, observing his Manichean system to be in danger from it, did not tay till he could see and consult the book itself, but | examined the hypothesis of our author as it was represented in Bernard’s extracts, and in a passage cited by the writers of the “Acta Eruditorum Lipsiae,” which had been omitted by Bernard. Bayle was blamed for this by Bernard, and not without reason, as he had manifestly mistaken the prelate’s meaning in many particulars, and attacked him upon principles which he would have denied but the dispute did not end so Bayle afterwards replied to Bernard and, having procured the bishop’s book, made several new observations upon it, which were published in the fifth tome of his “Reponse,” &c. Leibnitz also wrote “Remarks” on this work, which, however, he styles “a work full of elegance and learning.” These remarks, which are in French, were published by DeMaizeaux, in the third volume of the “Recueil de diverses Pieces sur la Philosophic, &c. par Mess. Leibnitz, Clarke, Newton, &c.” at Amsterdam, 1720, in three vols. 12mo. In the mean time, the bishop, though he did not publicly and formally reply to these writers, left a great number of manuscript papers, in which he considered their several objections to his system, and laboured to vindicate it. 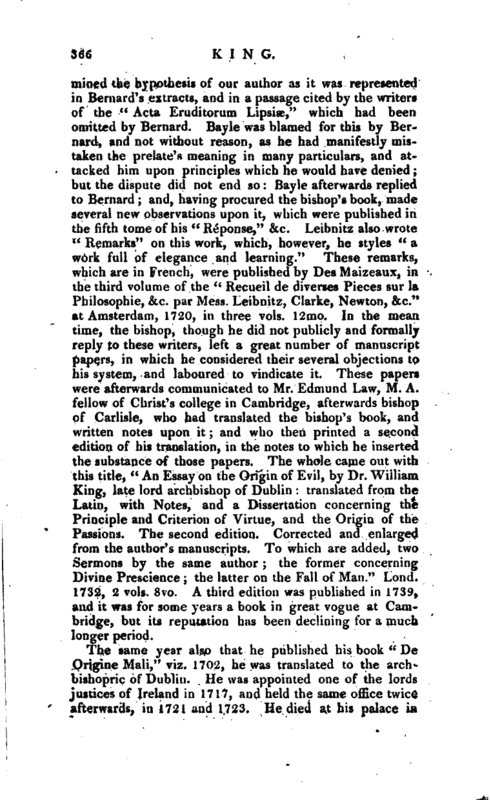 These papers were afterwards communicated to Mr. Edmund Law, M. A. fellow of Christ’s college in Cambridge, afterwards bishop of Carlisle, who had translated the bishop’s book, and written notes upon it; and who then printed a second edition of his translation, in the notes to which he inserted the substance of those papers. 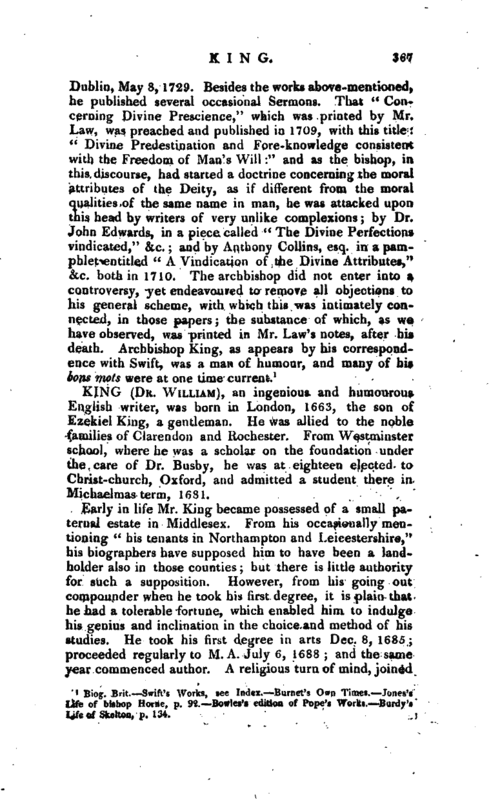 The whole came out with this title, “An Essay on the Origin of Evil, by Dr. William King, late lord archbishop of Dublin: translated from the Latin, with Notes, and a Dissertation concerning the Principle and Criterion of Virtue, and the Origin of the Passions. The second edition. Corrected and enlarged from the author’s manuscripts. To which are added, two Sermons by the same author the former concerning Divine Prescience the latter on the Fall of Man.” Lond. 1732, 2 vols. 8vo. A third edition was published in 1739, and it was for some years a book in great vogue at Cambridge, but its reputation has been declining for a much longer period. Biog. Brit. Swift’s Works, see Index. Burnet’s Own Times. Jones’s Life of bishop Home, p. 92. Bowles’s edition of Pope’s Works. Burdy’s Life of Skelton, p. 134.